High-energy linacs produce secondary particles such as neutrons (photoneutron production). The neutrons have the important role during treatment with high energy photons in terms of protection and dose escalation. In this work, neutron dose equivalents of 18 MV Varian and Elekta accelerators are measured by thermoluminescent dosimeter (TLD) 600 and TLD700 detectors and compared with the Monte Carlo calculations. For neutron and photon dose discrimination, first TLDs were calibrated separately by gamma and neutron doses. Gamma calibration was carried out in two procedures; by standard 60Co source and by 18 MV linac photon beam. For neutron calibration by 241 Am-Be source, irradiations were performed in several different time intervals. The Varian and Elekta linac heads and the phantom were simulated by the MCNPX code (v. 2.5). Neutron dose equivalent was calculated in the central axis, on the phantom surface and depths of 1, 2, 3.3, 4, 5, and 6 cm. The maximum photoneutron dose equivalents which calculated by the MCNPX code were 7.06 and 2.37 mSv.Gy -1 for Varian and Elekta accelerators, respectively, in comparison with 50 and 44 mSv.Gy -1 achieved by TLDs. All the results showed more photoneutron production in Varian accelerator compared to Elekta. According to the results, it seems that TLD600 and TLD700 pairs are not suitable dosimeters for neutron dosimetry inside the linac field due to high photon flux, while MCNPX code is an appropriate alternative for studying photoneutron production. Radiotherapy with high-energy photon beams represents the most widely used technique to treat tumors. Accordingly, medical linear accelerators, also known as linacs, are greatly utilized. It is difficult to measure photoneutron dose inside the treatment field due to very intense gamma irradiation. Several authors used passive detectors such as activation gold foils, bubble detectors, CR-39 nuclear track detectors and thermoluminescent dosimeters (TLDs) to study photoneutron production. ,,,,,,,,,,, Few studies have been devoted to the evaluation of the photoneutron dose in different linacs: Followill et al.,  measured the neutron fluence at the patient plane for various linacs using activation gold foils. Howell et al.,  used the same technique, measured neutron spectra, neutron fluences, and ambient dose equivalents for various linacs. The MCNP simulation has been used to study neutron production due to different problems in neutron dosimetry. Ongaro et al.,  evaluated the neutron production in the high Z components of a Siemens Mevatron linac. Chibani and Ma  studied the field size effects on neutron production and dose contribution from capture gamma rays. Kase et al.,  estimated neutron fluence and spectra at different points around a Varian Clinac 2100C/2300C. Zanini et al.,  calculated neutron ambient dose equivalent for different collimator configurations in a Varian Clinac 2300 C/D. In spite of large amount of information available, there is not much data about the neutron dose equivalent along the central axis where the photon flux is much higher than other area. This comparison was studied for different linacs' manufacturers. Only very recently, a detailed study was carried out by Martνnez-Ovalle et al.,  who calculated neutron absorbed dose, fluence, spectra, and dose equivalent in tissue for various linacs. In this work, thermal neutrons in Varian and Elekta linacs have been measured using TLD600 and TLD700 dosimeters and the Monte Carlo code MCNPX (v. 2.5). The study follows two points. 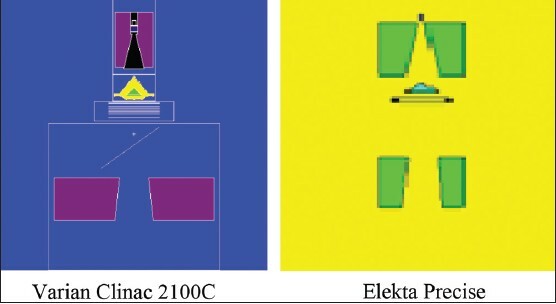 First, Varian and Elekta linacs have been investigated with the same methodology, in order to have a meaningful comparison. Secondly, the results obtained by TLDs and the MCNP code have been compared. Where σE=18 is the calibration factor calculated by 18 MeV linac photon beam and σCo is the calibration factor calculated by 60 Co source. To calibrate by 18 MeV photon beams, irradiation was performed in two procedures; by a thin layer of Cd over TLDs and without it. Cd is used to absorb thermal neutrons. By applying the Cd and irradiating pairs of TLDs by a same dose, the ratio of sensitivity factors is achieved through equations. TLD700 sensitivity factor is measured separately by its irradiation to several definite doses of 18 MV linac. Conclusively, TLD600 sensitivity factor is also obtained. The gamma irradiation of TLD chips by linac were performed in a Perspex phantom with the dimensions of 30 × 30 × 30 cm 3 , a field size of 20 × 20 cm 2 , at depth of 3.3 cm (maximum dose point), and the SSD of 100 cm. 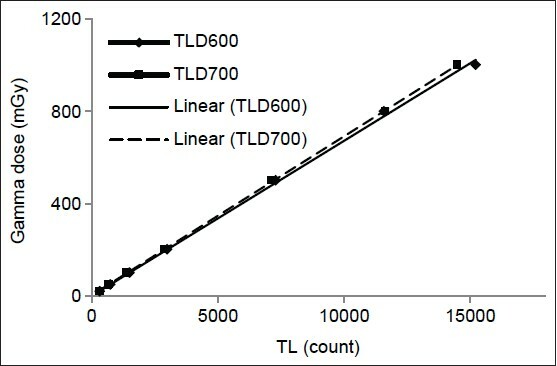 Pairs of TLDs with a 2 mm thin layer of Cd which was in between the incoming beam and TLDs, were exposed to definite doses of 50, 100, and 150 cGy at depth of dmax. TLD700 chips were also separately exposed to definite doses of 50, 100, 150, and 200 cGy at depth of dmax. For neutron calibration 241 Am-Be source with the activity of 5 Ci was applied. The area under glow curve of the TL signal as a function of thermal neutron dose was studied for all the dosimeters. The neutron average energy is 4.5 MeV. In order to thermalize neutrons, TLDs were placed at the side surface of polyethylene cube with the thickness of 6 cm. The distance of TLDs from the source was chosen 1 m. The dose rate at the point of TLDs was measured 131 μSv.h−1 . Neutron irradiations were done in four different time intervals; 21, 44, 64, and 111 h equal to 3, 6, 8, and 15 mSv, respectively. Where In represents the TL intensity due to thermal neutrons and is the neutron calibration factor. The medical linear accelerators investigated in this study were Varian Clinac 2100C and Elekta Precise. The energy of the photon beam was 18 MV and it was collimated to an area of 20 × 20 cm 2 at distance of 100 cm. Linac was set to deliver 300 cGy at the point of maximum dose depth, dmax, with dose rate of 300 MU/min. Measurements were performed in central axis by six pairs of TLD600 and TLD700 manufactured by KFKI Research Institute on the phantom surface and depths of 1, 2, 3.3 (d max ), 4, 5, and 6 cm. In order to avoid overlap of TLDs, each point was irradiated separately. [Figure 1] shows the setup of experiment for irradiation of TLDs on the phantom surface for two linacs. Neutrons are producing by photonuclear reactions in the high Z materials of the linac head. Therefore, to estimate the neutron production using Monte Carlo calculations, a detailed geometry of the linac head (target, primary and secondary collimators, flattening filters, etc.) is needed. A big sphere (R = 2.5 m) around the machine which was filled by air also simulated. The geometries were modeled according to the manufacturers' details. Electron beam with dimension of 5 mm radius, impinges the target. We assumed an electron point source beam in downward direction, Gaussian energy distribution according to manufacturer remarks. In both cases, slab phantom (water equivalent materials with the dimensions of 30 × 30 × 30 cm 3 at 100 cm from the source was simulated. In order to reduce run time, energy cutoff variance reduction method was applied for photons and electrons when the mode was electron-photon-neutron, because the threshold of neutron production is less than 8 MeV the energy cutoff was increased to 7 MeV for both electron and photon. Simulations were performed using the MCNPX code (v. 2.5). The neutron flux was determined in the phantom as a function of the depth, using the F4 tally. The sizes of the cells used for simulation was 0.5 × 0.5 and depth of 2 mm with cylindrical shape. For comparison between experimental and simulation results, flux to equivalent dose conversion factor were used in the range of thermal neutron energies. [Figure 2] and [Figure 3] illustrate the geometries used for the simulations. The composition and densities of the linac head components are given in [Table 1]. For both linacs, the neutron flux was estimated in the phantom along the central axis as a function of the depth, using the F4 tally. In order to have the neutron dose equivalent values, flux to equivalent dose conversion factors in the range of thermal neutron energies were used according to NCRP 38 Reports. The number of histories run in all cases was 2 × 10 9 , which assures that the estimated statistical error is <2%. 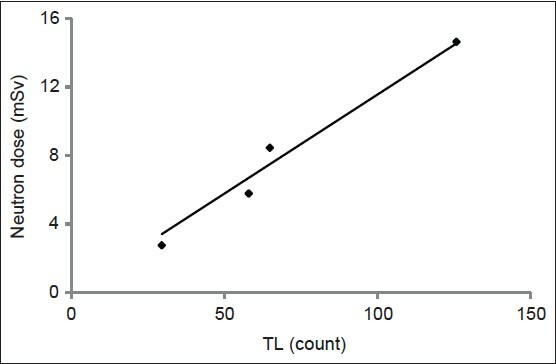 The TL response of the two dosimeters (TLD600 and TLD700) versus 60Co gamma dose is shown in [Figure 3]. [Figure 4] shows the TL signal, I n , as a function of thermal neutron dose for the TLD600 dosimeter. [Table 2] presents the gamma and neutron calibration factors of the dosimeters. The standard deviations, s, of the calculated quantities are also given. As it can be considered from this table, the gamma calibration factors of the two dosimeters are of the same order of magnitude. Nevertheless, the gamma sensitivity of TLD600 is a bit more than TLD700. The neutron sensitivity of TLD600 is higher than TLD700 because of the large neutron capture cross-section of the nuclei of 6Li in this dosimeter. [Table 3] gives the photon-absorbed dose and neutron dose equivalent values in central axis calculated by equations. The results are normalized to the dose of 1 Gy at the point of maximum dose depth, d max . The differences in gamma doses, Dγ are estimated by the values obtained by the measurement of 0.6 cc ion chamber dosimeter. These results show fairly a good agreement. From the [Table 3] it can be noticed that neutron equivalent dose, H n , is nearly zero at build up region. As the depth increases, H n , takes value and gets its maximum at the depths of 4 and 5 cm for Elekta and Varian linacs, respectively. It is because of the fact that TLD600 is only sensitive to thermal neutrons and the majority of neutrons on the phantom surface and build up region are fast neutrons. Linac fast neutrons with the average energy of 1-2 MeV are thermalized at depths of 4-5 cm of perspex. [Figure 5] shows the benchmarked Monte Carlo data with experimental percentage depth dose measurements. The measured and calculated doses are in good agreement (within 2%/2 mm). The maximum difference is less than 2% which validates the MCNPX simulations of the calculations. The neutron dose equivalents, Hn , are calculated relative to the number of initial electrons needed to generate an absorbed dose of 1 Gy due to photons in the maximum. In [Table 2], the values of D p max were included. [Figure 6] shows the neutron dose equivalent values along the beam axis, as a function of the depth in the phantom for the two linacs. Therein, squares correspond to Varian Clinac and circles to Elekta Precise. The results for the Varian accelerator are considerably larger than those found for the Elekta. 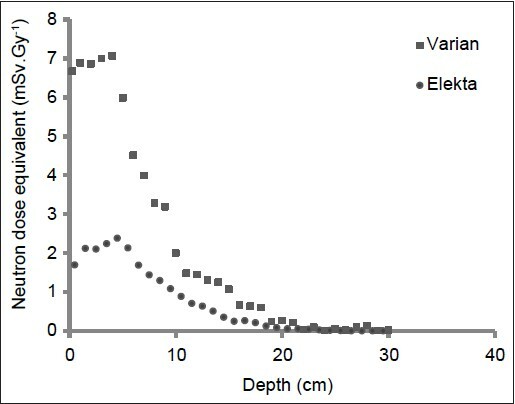 As it can be noticed from [Figure 6], the neutron dose equivalents at the entrance of the phantom (in the first few depth centimeters) grow up to the depths of 4 and 4.5 cm for Varian and Elekta linacs, respectively and then decreases. At depths over 20 cm these values are inconsiderable and can be ignored. [Table 4] includes the maximum photoneutron dose equivalent values, Hn, max, and the depth at which this maximum is reached, dmax . The maximum photoneutron dose equivalent for Varian is about three times higher than that of Elekta (7.06 mSv.Gy−1 versus 2.37). This larger production is mainly related to the materials and the geometry of the linac head configuration as well as the accelerating potential of the incident electrons impinging the target. 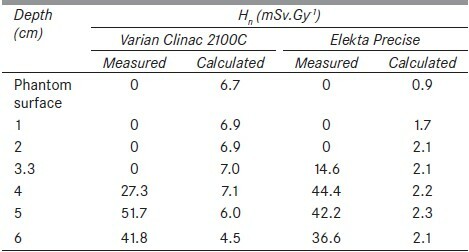 The comparison between the measured and calculated neutron dose equivalent values, Hn , at corresponding measuring depths is given in [Table 5]. As it can be noticed there is a significant difference between the results achieved by TLDs and those obtained by MCNPX code; the measured data are much more than calculated ones excluding the zero values in the first of depth centimeters. Several studies have been devoted to the evaluation of the photoneutron dose produced by the high energy linac. ,,,,,,,,,,,,,,,,, However, no similar work has been done by TLD pairs in the central axis. According to the results it seems that TLD600 and TLD700 dosimeters are not a reliable tool in the study of doses to patients from emitted photoneutrons along the beam axis. In all the measurements, the neutron dose uncertainty is very great because the contribution due to neutrons in the used mixed field is however much lower than the contribution due to photons. As it is reported in literature, , for high dose measurement in a mixed field such as linac field (high photon flux) and the reactor (high neutron flux), the lack of precision arises for neutron and gamma dosimetry, respectively. Esposito et al.,  also implied the high TLD error in neutron dosimetry in central axis, they mentioned that a very accurate knowledge of the TLDs photon sensitivity is needed to correctly derive the neutron signal and therefore TLDs are probably only suited for off axis measurements. As mentioned many studies have been carried out to analyze the linac produced photoneutrons, but most have evaluated only one type of linac and the methods used have differed widely. Only few studies have investigated the photoneutron production in different linacs. In the studies performed by Followill et al.,  and Howell et al.,  neutron fluence, spectra and ambient dose equivalent were evaluated at the patient plane using activation gold foils. Martínez-Ovalle et al.,  calculated neutron absorbed dose, fluence, spectra, and dose equivalent along the central axis in tissue by MCNPX code for various linacs. All these studies reported the significantly larger photoneutron production in Varian linacs compared to other commercially available ones (Elekta and Siemens) in the same nominal energy. The results obtained in this work [Figure 6] also represents that photoneutron production in Varian linac is much more than Elekta which is in consistent with the published data. This is mainly due to the fact that despite the same nominal energy in these machines, different manufacturers employ different strategies in the design of the accelerator. The number of photoneutrons originated is particularly dependent on the photon spectra and the materials forming the linac head components (the (γ, n) reaction cross-section varies with the two following factors: Gamma energy and the target atomic number). Beams with higher energies will result in more (γ, n) reaction and ultimately more neutrons will be produced. The beam energy is defined according to the maximum accelerating potential of the electrons striking the target. For a given specified energy, the maximum accelerating potential varies between different manufacturers, for example, a nominal 18 MV beam has the maximum photon energy of 18.75 or 15.3 MeV in Varian Clinac and Elekta precise, respectively. The fact that the electron energies tuned for Varian Clinac is larger than that for the Elekta contributes to the observed neutron production. Even though the energy of the initial electrons plays a prominent role in neutron dose, the materials used in the linac head are also important. Materials with higher atomic number will cause in more photoneutron production. As it can be seen from [Table 1], the flattening filter, primary and secondary collimators in Elekta Precise are made of lighter materials than those of the Varian Clinac. However, the target in the case of the Varian Clinac is made of W and that of the Elekta Precise has a mixture of W and other heavier material, Re. According to the results of this work [Figure 6], the neutron dose equivalents at the entrance of the phantom grow up to the depths of 4 and 4.5 cm for Varian and Elekta linacs, respectively and then decreases. In the study performed by Martínez-Ovalle et al.,  the neutron dose equivalent, calculated along the beam axis, has the maximum at the entrance of the phantom and reduces exponentially with the depth. This reduction is related to the cross-section for elastic neutron-hydrogen collisions at the maximum energies present in the neutron spectra. The results obtained by Chibani and Ma  in neutron absorbed dose showed the similar trend. Nevertheless, their reduction rate is much lower than that of Martínez-Ovalle et al.'s. Chibani and Ma calculated the neutron production in both the linac head and the phantom and therefore the neutron dose reduced with the lower rate. It is important to note that, in the studies carried out by Martínez-Ovalle et al., and Chibani and Ma, all neutron energy ranges were included and there was no distinction between thermal and fast neutrons. However, in our study only the neutron dose equivalent from thermal neutrons (E < 0.01 MeV) was considered in order to be compared with the TLDs measured data. Neutrons originated from linac head have average energies between 1 and 1.5 MeV. These fast neutrons undergo mainly elastic collisions with hydrogen. They lose energy until they become thermal at depths of 4-4.5 cm in the phantom and so the neutron dose equivalent reaches the maximum. At this point, thermal neutron capture becomes dominant and the neutron dose reduces with depth. Despite the fact that the results depend on the linac type and the measuring setup (most data available are given in the isocenter), we can compare our results with those presented in the literature. The Martínez-Ovalle et al. 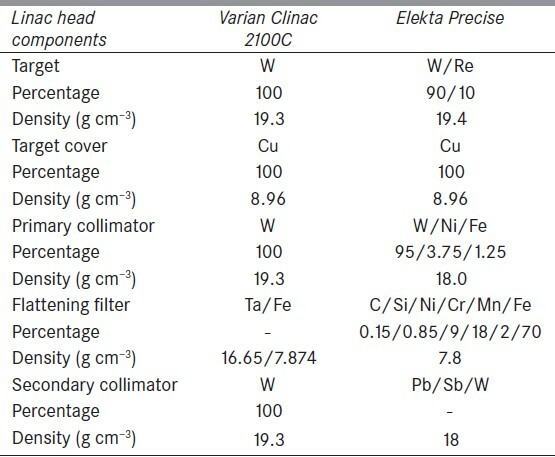 's study showed the maximum neutron dose equivalents of 60 and 28 μSv.MU−1 for 18 MV Varian 2100C and Elekta SL25, respectively, as against our 75.9 and 25.6 μSv.MU−1 for Varian 2100C and Elekta Precise in this work. It is important to note that, in the study performed by Martínez-Ovalle et al., the linacs were equipped with MLCs and the calculations were done for 10 × 10 cm 2 field size. Saeed et al.,  calculated the neutron dose equivalent of the 18 MV Varian 2100C by the Geant4 code about 4.4 mSv.Gy−1 at the isocenter; whereas, the values found by Fernández et al.,  were 6 mSv.Gy−1 using activation gold foils. These results show a reasonable agreement with what we found in this study (6.07 mSv.Gy−1 ). In this study the photoneutron contamination arising from the 18 MV Varian Clinac 2100C and Elekta Precise has been estimated using TLD600 and TLD700 pairs and the MCNPX code. The results represent the larger photoneutron production in Varian linac compared to Elekta due to the differences in the linac head configuration as well as the accelerating potential of the incident electrons impinging the target. According to the results, TLD600 and TLD700 pairs do not seem to be a reliable tool in the study of doses to patients from emitted photoneutrons in central axis, while the comparison of the MCNPX code results with other published data showed a coherent agreement, confirming the MCNPX code to be a valuable tool for studying photoneutron production along the beam axis. 1. Carrillo HR, Almaraz BH, Dávila VM, Hernández AO. Neutron spectrum and doses in a 18 MV Linac. J Radioanal Nucl Chem 2010;283:261-5. 2. Zanini A, Durisi E, Fasolo F, Ongaro C, Visca L, Nastasi U, et al. Monte Carlo simulation of the photoneutron field in linac radiotherapy treatments with different collimation systems. Phys Med Biol 2004;49:571-82. 3. Pena J, Franco L, Gómez F, Iglesias A, Pardo J, Pombar M. Monte Carlo study of Siemens PRIMUS photoneutron production. Phys Med Biol 2005;50:5921-33. 4. Hashemi SM, Hashemi-Malayeri B, Raisali G, Shokrani P, Sharafi AA. A study of the photoneutron dose equivalent resulting from a Saturne 20 medical linac using Monte Carlo method. NUKLEONIKA 2007;52:39-43. 5. Thomas DJ, Bardell AG, Macaulay EM. Characterisation of a gold foil-based Bonner sphere set and measurements of neutron spectra at a medical accelerator. Nucl Instrum Methods 2002;476:31-5. 6. Fernández F, Domingo C, Amgarou K, Castelo J, Bouassoule T, Garcia MJ, et al. Neutron measurements in a Varian 2100c linac facility using a bonner sphere system based on passive gold activation detectors. Radiat Prot Dosimetry 2007;126:361-5. 7. Esposito A, Bedogni R, Lembo L, Morelli M. Determination of the neutron spectra around an 18MV medical LINAC with a passive Bonner sphere spectrometer based on gold foils and TLD pairs. Int J Radiat Meas 2008;43:1038-43. 8. Kralik M, Turek K. Characterisation of neutron fields around high energy X-ray radiotherapy machines. Radiat Prot Dosimetry 2004;110:503-7. 9. Lin JP, Liu WC, Lin CC. Investigation of photoneutron dose equivalent from high-energy photons in radiotherapy. Appl Radiat Isot 2007;65:599-604. 10. Vanhavere F, Huyskens D, Struelens L. Peripheral neutron and gamma doses in radiotherapy with an 18 MV linear accelerator. Radiat Prot Dosimetry 2004;110:607-12. 11. Al-Ghamdi H, Fazal-ur-Rehman, Al-Jarallah MI, Maalej N. Photoneutron intensity variation with field size around radiotherapy linear accelerator 18-MeV X-ray beam. Radiat Meas 2008;43:S495-9. 12. Barquero R, Méndez R, Iñiguez MP, Vega HR, Voytchev M. Thermoluminescence measurements of neutron dose around a medical linac. Radiat Prot Dosimetry 2002;101:493-6. 13. Vana N, Shoner W, Fugger M. The LET dependence of LiF: Mg, Ti dosimeters and its application for measurements in mixed radiation fields. Radiat Prot Dosimetry 1999;85:263-6. 14. Weinstein M, German U, Alfassi ZB. On neutron-gamma mixed field dosimetry with LiF: Mg, Ti at radiation protection dose levels. Radiat Prot Dosimetry 2006;119:314-8. 15. Vega-Carrillo HR. TLD pairs, as thermal neutron detectors in neutron multisphere spectrometry Radiation Measurments 2002;35:251-4. 16. Triolo A, Marrale M, Brai M. Neutron-gamma mixed field measurements by means of MCP-TLD600 dosimeter pair. Nucl Instru Methods Phys Res 2007;264:183-8. 17. Followill DS, Stovall MS, Kry SF, Ibbott GS. Neutron source strength measurements for Varian, Siemens, Elekta, and General Electric linear accelerators. J Appl Clin Med Phys 2003;4:189-94. 18. Howell RM, Kry SF, Burgett E, Hertel NE, Followill DS. Secondary neutron spectra from modern Varian, Siemens, and Elekta linacs with multileaf collimators. Med Phys 2009;36:4027-38. 19. Ongaro C, Nastasi U, Zanini A. Monte Carlo simulation of the photo-neutron production in the high-Z components of radiotherapy linear accelerators. Monte Carlo Methods Appl 1999;5:69-79. 20. Chibani O, Ma CM. Photonuclear dose calculations for high-energy photon beams from Siemens and Varian linacs. Med Phys 2003;30:1990-2000. 21. Kase KR, Mao XS, Nelson WR, Liu JC, Kleck JH, Elsalim M. Neutron fluence and energy spectra around the Varian Clinac 2100C/2300C medical accelerator. Health Phys 1998;74:38-47. 22. Martínez-Ovalle SA, Barquero R, Gómez-Ros JM, Lallena AM. Neutron dose equivalent and neutron spectra in tissue for clinical Linacs operating at 15, 18 and 20 MV. Radiat Prot Dosimetry 2011;147:498-511. 23. ICRU, International Commission on Radiation Units and measurement. Neutron dosimetry for biology and medicine. 1977; Report 26. 24. Bedogni R, Esposito A, Angelone M, Chiti M. Determination of the response to photons and thermal neutrons of new LiF based TL materials for radiation protection purposes. IEEE Trans Nucl Sci 2006;53:1367-70. 25. In: Pelowitz DB, editor. MCNPX user's manual, version 2.6.0. Report LA-CP-07-1473. Los Alamos National Laboratory; 2008. 26. Gambarini G, Roy MS. Dependence of TLD thermoluminescence yield on absorbed dose in a thermal neutron field. Appl Radiat Isot 1997;48:1467-75. 27. Saeed MK, Moustafa1 O, Yasin OA, Tuniz C, Habbani FI. Doses to patients from photoneutrons emitted in a medical linear accelerator. Radiat Prot Dosimetry 2009;133:130-5.